Aside from your gown, your wedding hair and makeup will be one of the most important components of your wedding day look. However, with so many different hair and makeup styles to choose from, it can be difficult to decide on just one. Of course, your wedding day will likely be heavily photographed, and you want to be able to look back on photos years from now and love the way you looked! We’ve put together some useful tips for selecting your ideal wedding hair and makeup so you can look and feel your most beautiful. Updo, down, or somewhere in between? Veil or no veil? There are so many decisions that go into your wedding-day hairstyle choice. Start by carefully considering your hair length and texture. If you have medium to long hair, you’ll have more options to choose from than if you have short hair. However, if your hair is currently short, but you have a year or more to grow it out, you can expand your options as well. There is always the possibility of getting extensions for your big day, too! Generally, it’s best to stick with a style that will work with your natural hair texture. For example, if you have naturally straight and fine hair that doesn’t hold a curl well, a slick and sleek style may be best. One of the most important things to keep in mind when deciding on a hairstyle is the dress you’ll be wearing; for this reason, it’s generally best to wait until after you’ve purchased your gown before you decide on your wedding hair. After all, your gown style and neckline can have a huge impact on the type of hairstyle that would flatter you best. For example, if you’re opting for a strapless gown and want to accentuate the neck and collarbone area, then an updo would likely be best. You don’t need to have your wedding-day accessories completely chosen in order to decide on a wedding-day hairstyle, but you should at least have some idea as to which accessories (if any) you’ll be wearing in your hair. A veil, for example, can drastically change the appearance of your hairstyle, as can clips and barrettes. Finally, consider the environment in which your wedding will take place. For instance, if you’ve opted for an entirely outdoor wedding, an updo may be a more practical decision. This way, if it’s windy out or even if it rains on your wedding day, your style will be better able to hold. On the other hand, an indoor wedding makes it a little “safer” to experiment with other styles, including styles that involve wearing your hair partially or completely down. Of course, deciding on your wedding makeup can be just as difficult as choosing your hairstyle! Whether you want to go for a natural or dramatic look, keeping some tips in mind will help you out along the way. You want to look beautiful on your wedding day, but you don’t want to be wearing so much makeup that you no longer look like yourself. When you first meet with your makeup artist, try to explain your everyday makeup routine to him or her so they can make sure not to do anything too dramatic. Generally, it’s best to choose one or two of your favourite facial features and have your makeup artist emphasise them. Love your eyes? Consider a bold, dramatic eye that will blow your spouse away. Just be careful not to overdo it. For example, if you go with bolder eye makeup, you probably don’t want to also choose a bold lip colour (and vice versa). Playing up just one or two features goes a long way. Talk to your makeup artist about the type of colour palette you’re interested in for your wedding day. Your wedding colours, along with the time of year in which you’re getting married, can provide some inspiration here. For example, if you’re having an autumn wedding, lovely plum and deep red colours can be a beautiful option! Even once you have a better idea of the hair and makeup styles you want for your wedding day, there are a few additional tips worth keeping in mind. Make sure you set aside plenty of time to have your hair and makeup done. Talk to your hair and makeup artists ahead of time and ask them how much time you’ll need. If you’re commuting to the salon, don’t forget to factor in travel time—and add a 30-minute buffer, just to be safe. Nothing is more stressful than running behind-schedule on your wedding day. 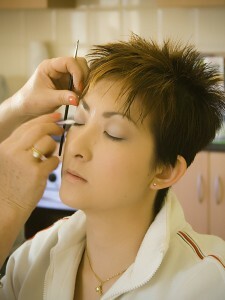 About a month before your wedding day be sure to have a hair and makeup trial. This is a great way to get a better idea of how your look will come together and will give you an opportunity to make any changes before the big day so you can look and feel your best! Trials also help your makeup artist and stylist get a better idea of how much time they’ll need to complete your look on the big day. It never hurts to have a touch-up kit with you (or with a bridesmaid) on your wedding day. This kit should include hairspray, hairpins, and a touch-up of your lipstick colour. In between your ceremony and reception, take a couple of moments to freshen up your look so you’re ready for dinner and dancing! Choosing your wedding-day hair and makeup isn’t easy, but with the right considerations in mind, you’ll be well on your way to looking and feeling your best on your special day.